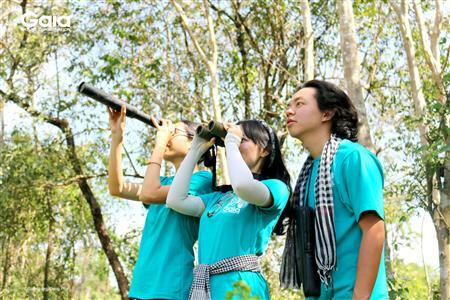 Vietnam Track is really glad to become a communication partner of the bilingual camp at Cat Tien National Park organized by Gaia Nature Conservation*. *Gaia Nature Conservation is a national not-for-profit organisation of Vietnam, based in HCMC. Gaia empowers people in nature conservation and environment protection in order to create a future where human is living in harmony with Mother Earth. You are wondering what’s amazing things/stories could you found in a tropical forest? You want to experience the nights staying in the middle of the jungle and blend in the beautiful and transquil nature? You are seeking for ways to de-stress from work and lives. You would like to lead a positive and happy life? This bilingual camp is for you and 20 youths throughout Vietnam. Cat Tien National Park, Dong Nai Province. One of the most beautiful and high biodiversity National Parks in Vietnam. Foreigners will receive a support of 700,000VND. Ms. Huyen Do – Founder & Executive Director of Gaia Nature Conservation. Ms. Huyen has over 18 years of experience working on nature conservation in Vietnam, especially in inspiring and educating different target groups in nature protection. Huyen’s passion for the nature and her job is so strong that she feels like she doesn’t have to work a day in her life. “All creatures in the forest are amazing in their own way. It’s important that people recognise their beauty and amazing facts and to highly appreciate the beautiful nature. Mr.Ho Nhat Ha – Mr. Walking. The guy that walk 2300km from Sai Gon to Ha Giang Province with just a guitar and 100,000 VND. His talent of composing songs and playing guitar will inspire every campers with his gentle nature music. You will also get to know more about his famous walk of 2300km with almost no money. Professional staff of Gaia and Cat Tien National Park. LOVE. You will more highly appreciate the nature and the surroundings. You will also be connected with other campers who might be local outstanding Vietnamese. You will also be connected to yourself, to de-stress, to think positively, and to love yourself and what you are doing more. Gaia is organising this Camp on the principle of not-for profit. Many creative activities that are applied in famous national parks of the world are modified to be suitable to the nature of Vietnam, and of course to our campers. 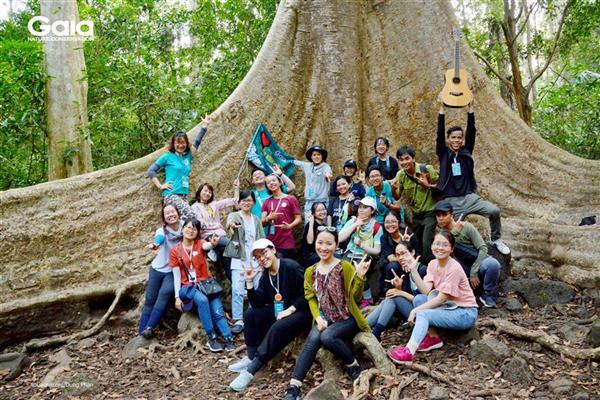 The Camp is developed and facilitated by one of the most experience and enthusiastic conservationist in Vietnam Ms. Huyen Do – Founder& Executive Director of Gaia. The Camp will definitely be: SAFE, RELAX with full of fun, CREATIVE, MEANINGFUL and focusing on camper’s EXPERIENCE. ​5.45. AM. Gathering at Gaia Nature Conservation Office (63A Nguyen Cu, Thao Dien, District 2). Registration and get ready to depart. 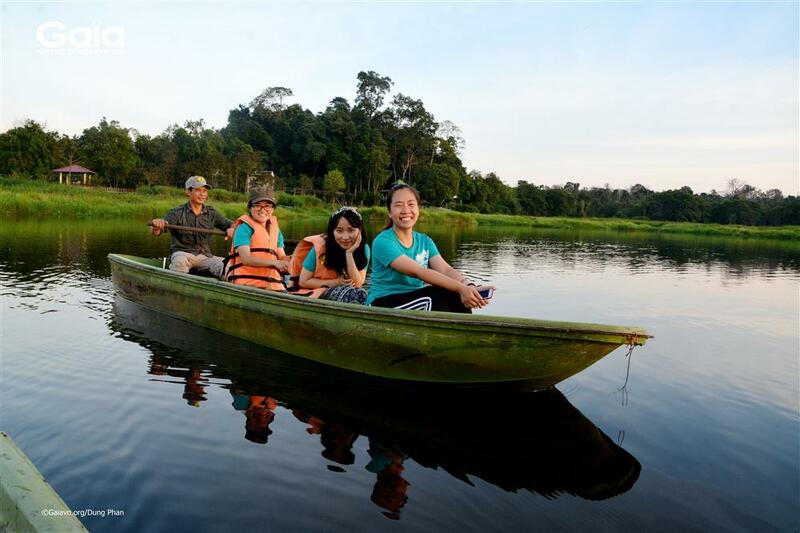 Depart for Cat Tien National Park (Bus activities: Breakfast, Introduction, Nature information and game, connection game, grouping…). Arrive at Cat Tien National Park, check in the Park’s hotel. Lunch at Cat Tien National Park. Visit Bear Rescue Station, observe and learn about Bears, Yellow-cheeked Crested Gibbon. 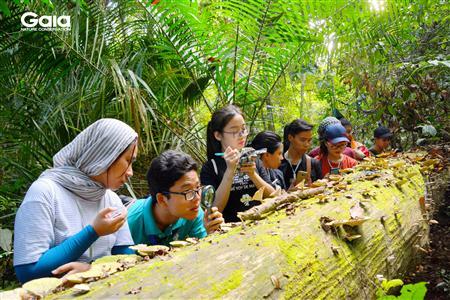 Discover the nature on the Giant Tung Tree Trail. (Discover animal tracks, mushroom and fungies, timber, vine and etc). Visit the Ben Cu Rapid: challengeforchange: Collecting garbage at Ben Cu Rapid. A Night wildlife Tour by special Bus. Meditation: Self-connection and nature connection. Transport to Dac Lua forest with the special bus-Discover the giant Banyan. Discover the nature on the walk to Crocodile Lake. Work in group to research the nature. Rowing on Crocodile Lake (don’t worry, this is totally safe and peaceful). Dinner with fish dishes from the lake. Exchange with rangers of the Crocodile Lake, tale of the last Rhino. Meditation: self connection and nature connection. Observe beautiful sunrise and transquil morning on the Lake. Get on bus for HCMC. (Talk and games). 18.00. Farewell at Gaia office. Foreigner campers will donate 2,460,000 VND (Gaia support you with 700,000VND). Note: This camp is totally a not-for-profit camp,with the aim to connect the youth to the nature. Within 2 working days after filling the form, if you are selected, you will receive an invitation letter from Gaia. Please make your payment accordingly. If you have made your payment but cannot participate. Please inform us immediately. 16 days before departure: you will be refunded with 50% of the camp fee. 15-7 days before departure: you will re-funded with 30% of the camp fee. 6 days before departure: We are sorry that you will not receive any refunding.